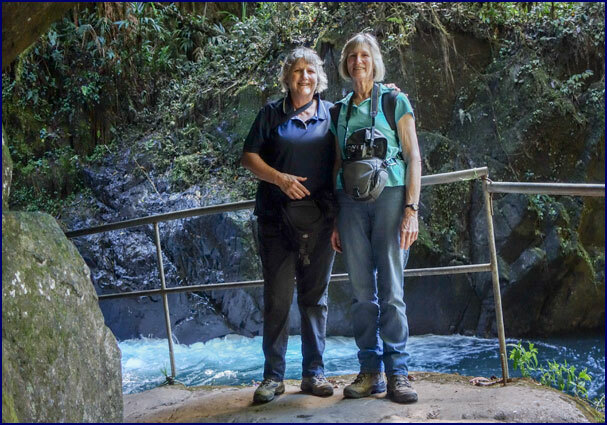 My close friend Jineen and I try to take a trip someplace fun and exotic every year; in January 2017 we chose Costa Rica. Leaving out of Dulles on January 3, we changed planes in Panama City and arrived in San Jose, Costa Rica, around 5:00 pm. We breezed through customs; being first off the plane is one of the perks of flying first class, courtesy of frequent flier miles. I had visited Costa Rica briefly in 2015, but Jineen had never been there. We exchanged some money at the airport without really understanding the currency; the teller gave us a handful of crisp bills marked 10 mil colones, which he explained were worth about two dollars each. Apparently one Costa Rican colon is worth something like 0.0018 of a dollar! We picked up our rental car, a compact little SUV that drove like it had a few too many kilometers under its fan belt. It was rush hour, so our plan was to visit a grocery store and stock up on �happy hour� supplies for the week while waiting for traffic to thin down. Navigating by Googlemaps while we searched for an open shop, we toured several small streets and questionable neighborhoods, encountering snarled traffic and drivers with little inclination for yielding the right-of-way. I concluded that San Jose at rush hour is a hellhole. We eventually gave up and braved rush hour, heading for the town of Cartago where we were staying that night. Finally locating a small store, we came away with some white wine in a box (the best they had to offer) and some snacks, including a fresh mango. We checked in to Grampas Hotel (the proprietor of which must surely have been Grampa), lugged our suitcases down the hill (cognizant of the fact that in the morning we would have to lug them back up), and had happy hour. The box wine proved to be surprisingly good, but we soon realized our mistake concerning the mango; we had no knife to cut it up with. It proved a messy job carving it up with a spoon - but it was delicious. After breakfast we headed out to visit the Irazu volcano. The narrow road wound up a steep mountainside, and our little SUV felt like it had seen better days, the motor laboring as the transmission slipped in and out of low gear. As the road climbed ever upwards we passed cows and calves tethered beside it, a colt grazing loose on the shoulder, and a man mounting up to ride a mule. Reaching the summit of the Irazu Volcano, we stood on a high lookout platform. 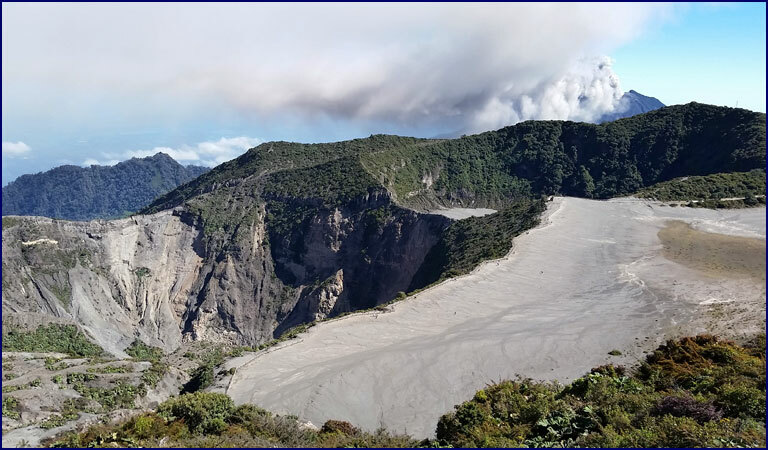 There was a stunning panoramic view of rugged mountains, dominated by the Turrialba Volcano to the northeast. We noticed that great clouds of smoke and ash were rising from it; we had not realized it was so active. The Turrialba Volcano erupting, viewed from the Irazu Volcano. After a while we went to a lower viewpoint where we could look down into the double crater below, surrounded by rock slides and craggy outcroppings. We walked along the edge of the crater; there were only a few other people there. We picked up some old pieces of lava; they seemed oddly warm to the touch and felt alive in our hands. We slipped a few pieces into our pockets, ignoring the signs that forbid removing any rocks. The little car�s brakes squeaked alarmingly as we drove back down the long steep road. Along the way we noticed some unfamiliar yellow caution signs that were difficult to interpret; we were undecided whether they portrayed jellyfish with long tentacles, a meteor, or flying molten lava fireballs (in hindsight, probably the latter). Back in town, we located a decent grocery store and stocked up on wine and snacks for the week�s happy hours. Then we set out for the Suria Lodge in the San Gerardo de Dota Valley, high in the mountains, our home for the next four nights. The road climbed relentlessly, gradually leaving the traffic behind. Our tired little SUV struggled up the steep grades with the motor racing; driving on these steep mountain roads it was no wonder the transmission sounded bad. I guess that Costa Rica would be a hard place to be a rental car. We stopped at a little open-air restaurant and bought some lunch. We were still quite confused by the currency; I held out a wad of money and let the proprietor take whatever we owed him. He chose about eight of the 10 mil colones notes and several coins; I was hoping I hadn�t just paid $145 for our tacos. We took the turnoff for the San Gerardo Valley, and headed into the Los Quetzales Parque Nacional (Quetzal National Park). We followed a very narrow winding road which headed steeply downhill. As we went on the road got smaller and even steeper; it was literally carved into the sheer mountainside. The pavement soon turned to gravel, and the gravel to dirt. There were tight hairpin turns above thousand-foot drop-offs, and places where the side of the road was severely crumbling away beside deep ravines. No guardrails, of course. In several places men were repairing the road by hand, using shovels. Looking down over the San Gerardo Valley. The scenery was breathtaking. We stopped the car and gazed in awe at the tiny ribbon of road winding down through the valley far below us. Really, it was an impressive feat of engineering that a road could be built at all on these near-vertical forested slopes. It was ten kilometers down to the Suria Lodge at the end of the road, but it seemed more like fifty as we slowly made our way down the mountainside, brakes squeaking on every turn. I was glad Jineen was driving! We passed a few houses and several lodges; we were amazed that trucks large enough to haul building materials had been able to drive down the valley road. 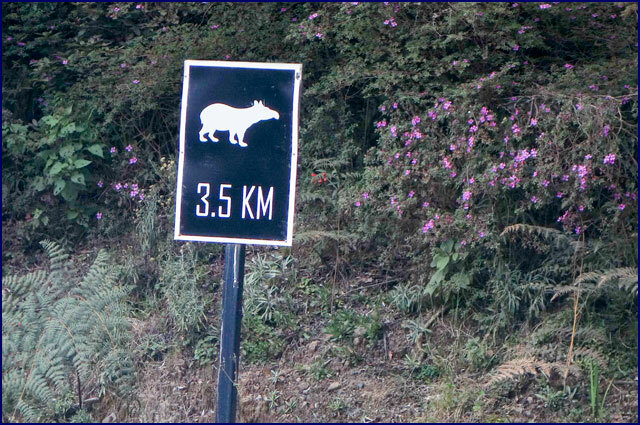 There was a tapir crossing sign, but these rare animals live deep in the forests where they are virtually never seen. We were less than two kilometers from the Suria when we came to a spot where the road was closed for repair. We were informed that the repair would take an hour and a half. We walked down to check out the roadwork; a bulldozer had dug a huge ditch across the road and the crew was replacing a large culvert. Three hours later, they finally had it filled in enough that we could pass. The delivery truck in front of us, with its wider wheelbase, barely made it across the rough repair, lurching and swaying precariously as the edge of the road crumbled out from under it wheels. 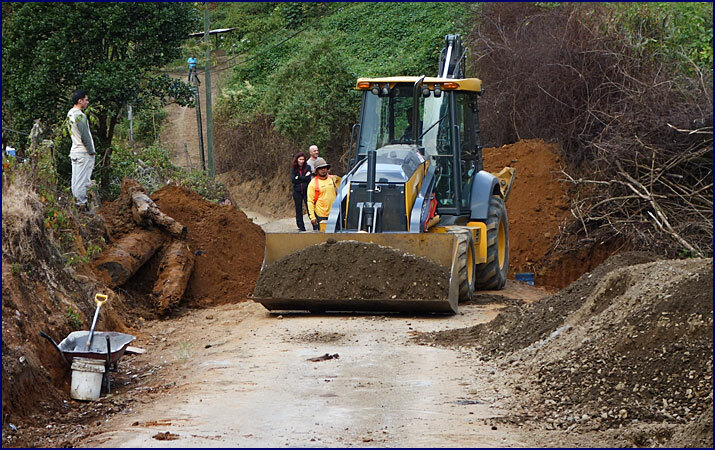 Roadwork in the San Gerardo Valley. It was pitch dark by the time we eventually found El Hotel de Monta�a Suria, after missing the turnoff the first time. We checked in with Manuel, who managed the hotel and ran the front desk. He tried to give us directions to our cabin, but his English was limited and our Spanish was worse, so it took us a while to find our room. Later we met up with Agneil, the resident guide, and made plans for the following day. We were both tired and I was fighting a sore throat, so we had our happy hour in the room and then went to sleep. 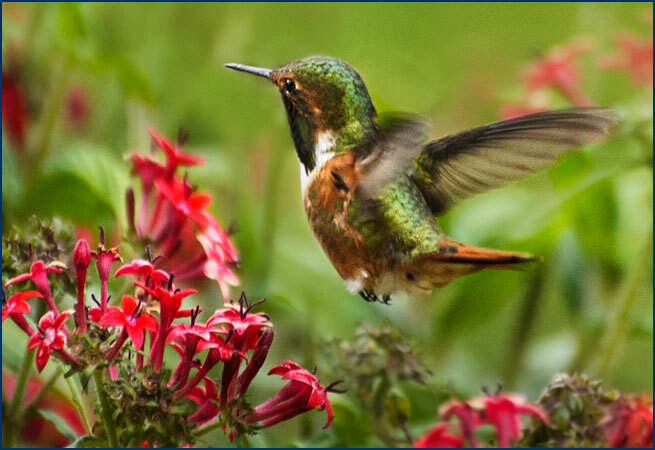 The San Gerardo valley is renowned for its birds. 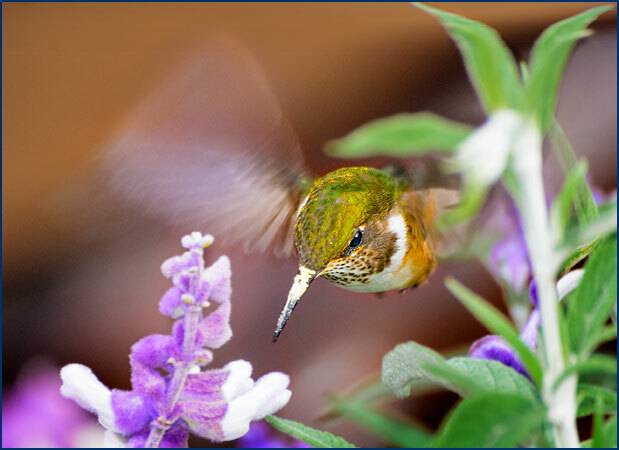 Jineen saw a hummingbird out the window before she even got out of bed! It was cold at this elevation and the room had no heater, so we were shivering as we got dressed. We stood on the balcony and watched the birds in the flower gardens before going up to the lodge for breakfast. Manuel, the manager, was also our waiter. 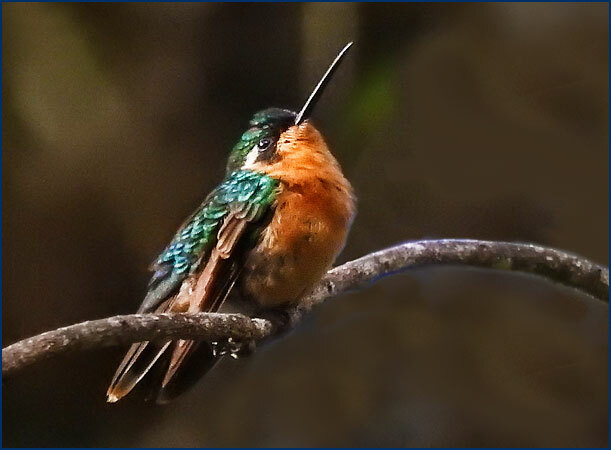 A scintillant hummingbird greeted us in the morning. The Suria was a lovely lodge; there were a dozen or so cabins with two guest rooms in each, surrounded by flower gardens. We were in the furthest cabin, where the lawns and gardens were less formal and more natural. The restaurant and lounge were in an attractive wood and glass building, and a cozy fireplace provided some warmth. We set out for a hike on the Waterfall Trail. We walked on the road down a steep hill to the trailhead. It was a pleasant walk through the woods alongside the Savegre River, a beautiful rocky stream. A few people were out fishing. We passed a trout hatchery, and the trail narrowed and wound through the woods. 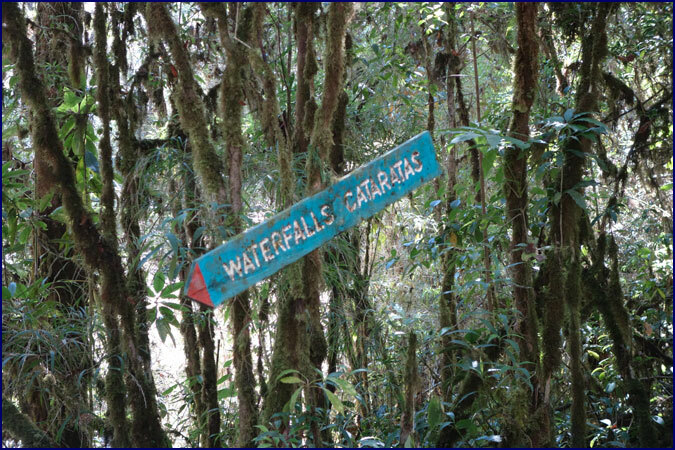 We knew this area was considered cloud forest, though in the bright sunshine it didn�t look the part � very different from the misty cloud forest I had visited in Monteverdi in 2015. After a couple of kilometers we came to the top of Cave Falls. A boulder the size of a small house formed a sort of cave, with the water cascading down past it, very powerful and loud. We climbed down over the slippery rocks and some steep stairs to see the falls from below. We propped my camera on a rock to take a selfie beside the water rushing down through the tiny canyon. Jineen and I at Cave Falls. The guide, Agneil, had told us that there was a second, larger waterfall if we continued on, but he cautioned that the trail was not in good shape. Boy was he right about that! 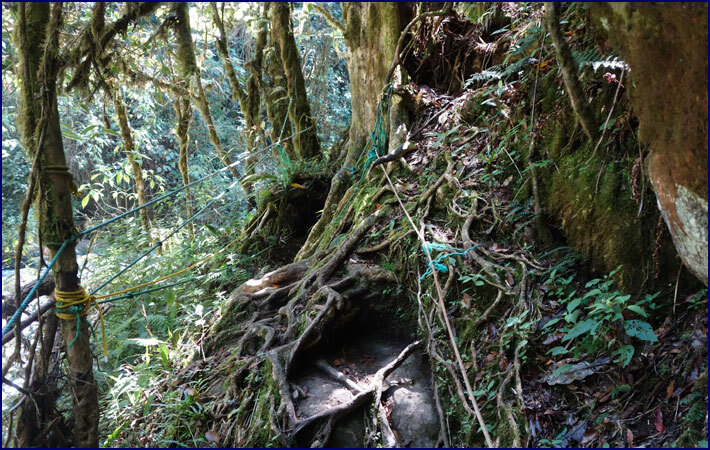 We scrambled along the side of a steep slippery slope, clambering over tree roots and rocks. There were thin ropes stretched alongside the most treacherous spots to serve as a handrail, and metal mesh footbridges across narrow chasms. We came across two ladies sitting in the path; one of them appeared quite weak and faint - we revived her with chocolate. The trail was not in the best of shape! Note the rope handrails. 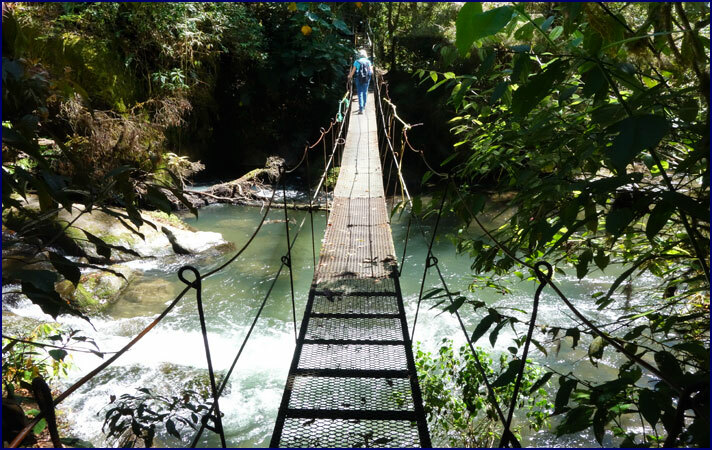 Before long we came to a rickety hanging bridge; it looked like something from an Indiana Jones movie. We crossed it one at a time, carefully, keeping our feet on the metal support bars, as the mesh flooring was torn through in a dozen places. On the far side we climbed up a flight of metal stairs incongruously set in the mountainside, but the mesh treads were broken out of most of the steps, and entirely gone on the landing platform. After about a kilometer we descended a cliff face by way of a series of more of the metal stairs built into the mountainside, and these were in even worse shape. We descended half a dozen treacherous flights, each in a greater state of disrepair than the last; I clung to the ropes provided as handrails and carefully picked my way down. I could hear the roar of the falls below us. We went down the final hellish staircase and came out to a small cliff above the stream. Below us was a churning pool, but to the right our view of the falls was blocked by a big rock outcropping. 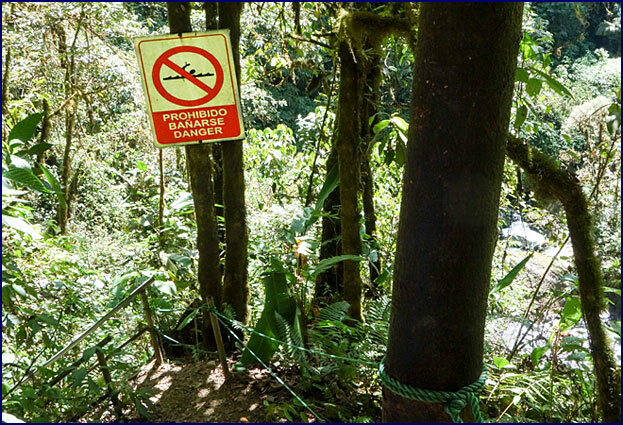 There was a sign posted on a tree with the international symbol for no swimming - a graphic of a person attempting to swim in turbulent waters, with a red circle with a slash through it. Looking down, we could see a narrow muddy ledge below us, from which it appeared there would be a view of the falls. �Let�s go down there,� Jineen said. What, are you nuts?! There was a rope stretched out across the face of the rocky escarpment. The only way down was to sort of rappel down backwards, using the rope. Jineen has no fear of heights, but I do - to me this looked impossible. I was thinking maybe we could just enjoy the sound of the falls from here, and look at the churning pool below them . . . but by then Jineen had already grabbed the rope and slid down to the ledge. Shoot, now I had to do it! The only way down to Savegre Falls. I grabbed the rope, facing uphill, and slowly rappelled down the steep rocky face, Jineen encouraging me as I went. It was terrifying, amazing. There�s nothing like pushing yourself out of your comfort zone to feel the full zest of life - but how the hell was I going to get back up? 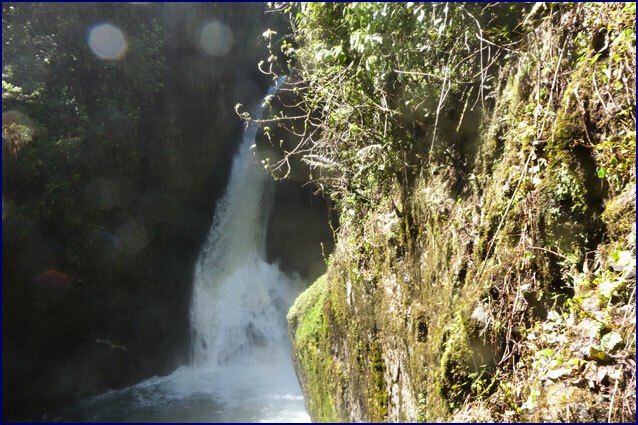 We cautiously made our way out on to the little ledge, and indeed, there was a great view of the Savegre Falls, thundering down at us from sixty feet above. We stood there for a while and marveled at the grandeur of it, the spray from the cascade gently soaking us. We were just starting to think about making our way back up again when we heard voices, and a Costa Rican family of about ten people and two dogs appeared at the top of the outcropping. 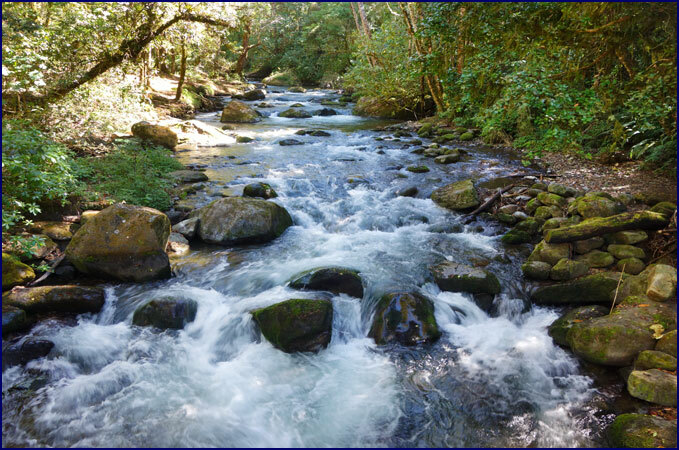 A man and a young boy rappelled down with fishing gear and waded unhesitatingly into the swirling waters, and the rest of them sat down to wait, blocking our route back to the trail. Getting back up past them appeared challenging. 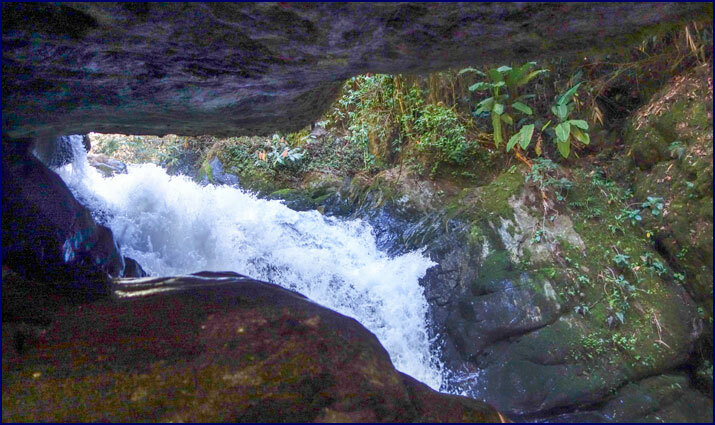 Savegre Falls - I was too nervous to get a good photo! After waiting a while it was evident that they weren�t going anywhere, so we started climbing up. It turns out rappelling is much easier done down than up, but by pulling on the rope I managed to scramble up the hazardous rock face and clamber past the family. We then climbed back up flight after flight of those dreadful staircases, our legs burning from the exertion, and finally made our way back to the trailhead. I was really wishing that we had parked the car there; the final steep uphill hike to the lodge was a killer! This little sparrow hung out with us on our balcony. We lunched on our happy hour supplies; cheese and crackers with excellent locally-grown avocados. We spent a pleasant hour and a half sitting on our cabin balcony watching and photographing the birds; we could see dozens of types without even getting up. 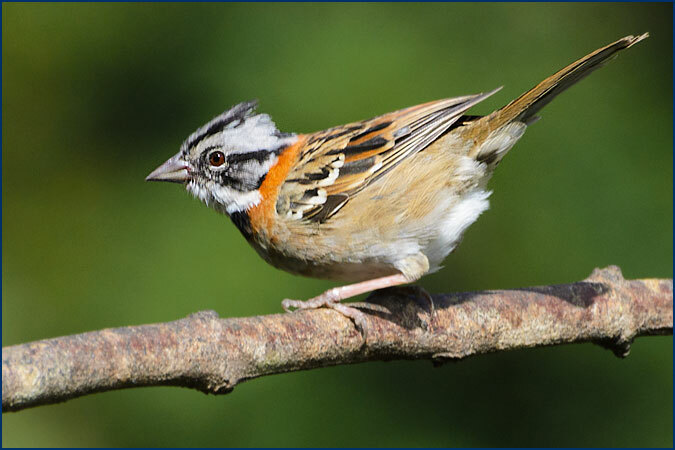 Little rufous-collared sparrows hopped around the porch begging for crumbs. 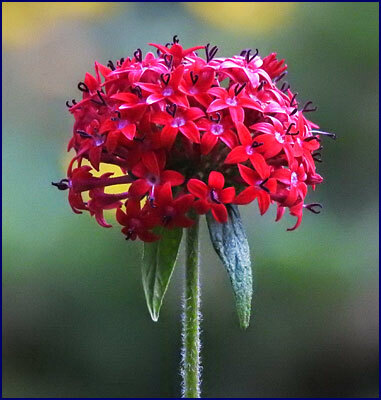 Hummingbirds hovered around the flowers, and a flock of green parakeets flew overhead, chattering busily. 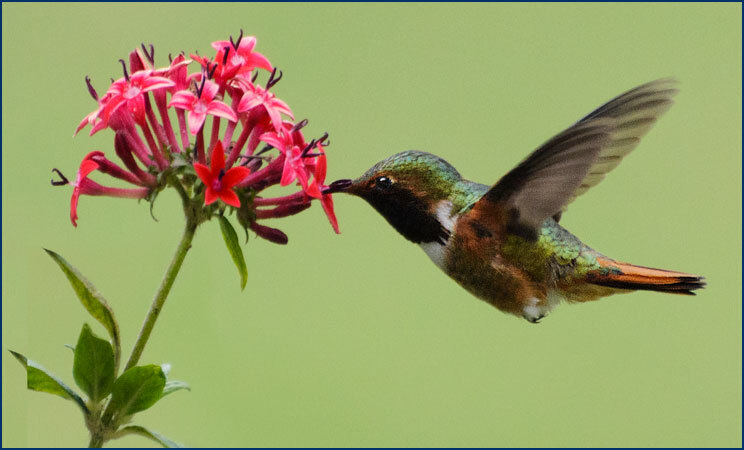 A scintillant hummingbird, feeding just outside our cabin. In the afternoon we met up with the Agneil for a birding tour. He drove us in our rental car to Savegre Lodge, where we took a narrow winding dirt road that climbed quite high up a steep mountainside. We parked the car and set out on the one-mile loop birding trail. Agneil carried a large high-powered spotting scope, and we stopped often to identify birds. 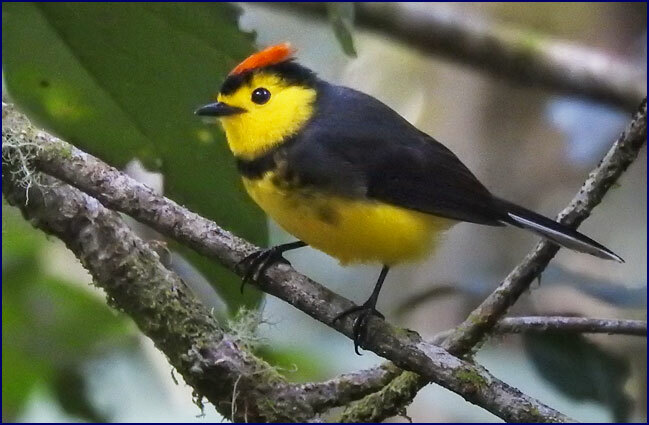 Some of the highlights included the magnificent and mountain gem hummingbirds, the band-tailed pigeon, the black-cheeked woodpecker, Wilson�s warbler, and a collared redstart. If they sat still long enough Agneil could find them with his scope; amazingly we could take decent photos through the scope with a cellphone. It was really interesting, and we were becoming increasingly enthusiastic about identifying the birds. Our trail led through the cloud forest, though there were none of the misty clouds one expects. Agneil told us that most of the big trees were oaks; each was an ecosystem to itself, with many vines, bromeliads and other plants growing on them. I commented on the difference between this cloud forest and those at Monteverde; Agneil said it was because we were at a much higher elevation. We were in the high montane zone, where Monteverde was low montane. I still wasn�t sure if that was why the clouds were missing . . .
Agneil and Jineen on the birding trail. 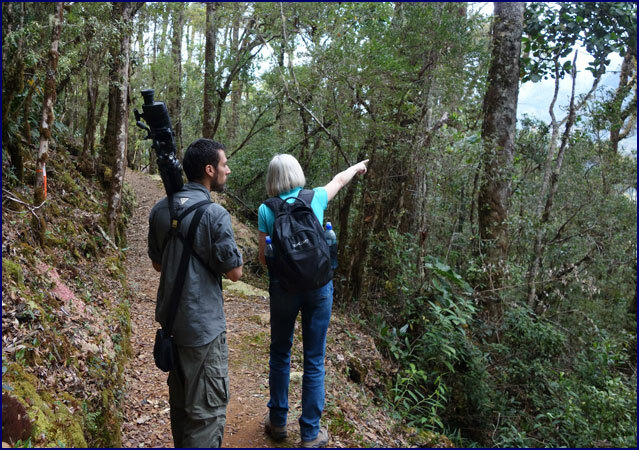 Agneil was amazing at spotting birds; he identified dozens of different types - we wouldn�t have seen half as many without him. Many he found by first hearing their song. Looking out through the trees, we could see swifts flying high and buzzards circling over the valley. At one point Agneil stopped because he heard a faint noise; we waited, and before long a group of exquisitely marked quail crept through the underbrush. A bit further on we again heard noise in the underbrush, but this time it was much louder - something big was coming! We stood silently, waiting to see what would appear. A white-nosed coati crossed the trail ahead of us, and then another. They were so cool! 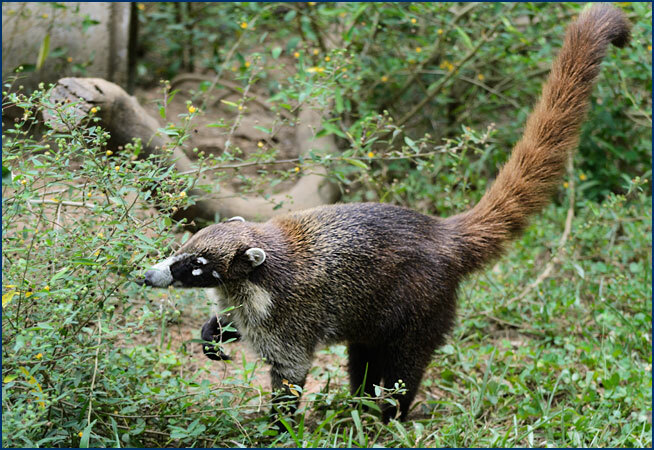 A member of the raccoon family, the coati has a long nose, a black mask, and a bushy ringed tail. They look sort of like an elongated raccoon, though a bit larger. We watched as they snuffled along beside the trail and walked across a log; they were soon joined by several others, eight in all. When they moved out of sight we went forward hoping to catch another glimpse of them; we saw one run up a tree and several others went crashing off through the underbrush at our approach. We had been out for about two hours and had covered less than half of the loop trail, so Agneil had us pick up the pace on the last section, which was all uphill. When we got back to the car we found a large black bird sitting in a nearby tree; Agneil identified it as a black guan, a relative of the turkey. We had really enjoyed the hike and learning about the birds. We were tired but happy as we returned to the lodge and dined on excellent trout, fresh from the hatchery by the waterfall trail. The temperature was dropping again, so we asked the manager, Manuel, for a heater for our room; he gave us one from the unoccupied cabin next door. Much cozier!